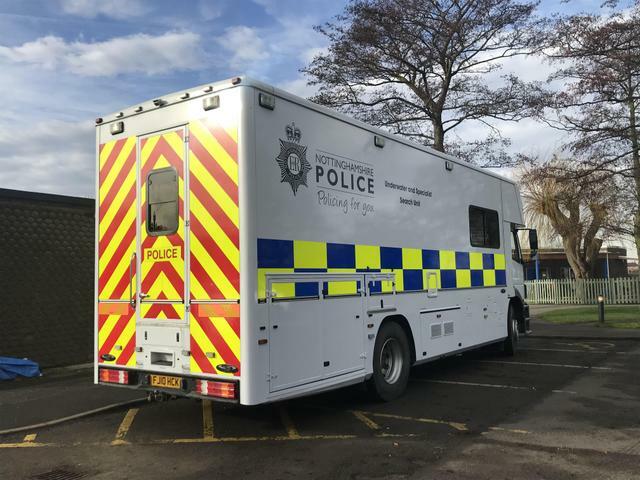 Welcome to our Mini-Police page. 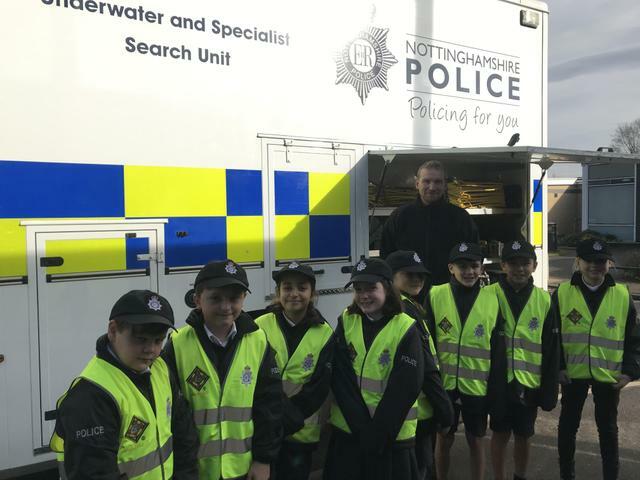 Carnarvon has been selected by the Nottinghamshire Police to be one of three schools within the county to take part in their new initiative - the 'Mini Police'. 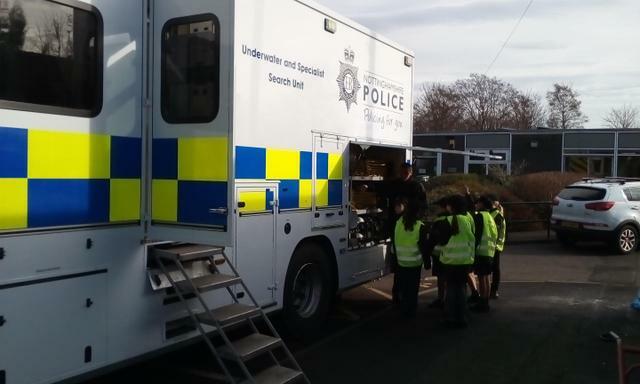 We will be working alongside the police and other emergency services so that the children can see a wide range of job roles and learn about what the police do. Please find details below on all the events we have taken part in. 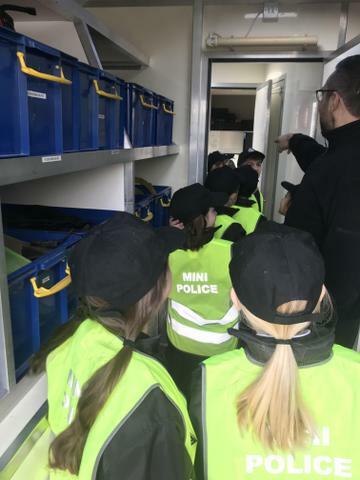 Yesterday the Mini-Police visited the NET Wilkinson Street Tram Depot, for a tour of the control room and to learn about safety on buses and trams. 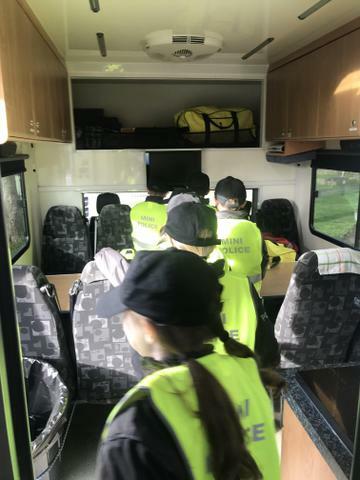 The children went on a tram simulator and learnt what hazards they need to look out for when driving a tram. 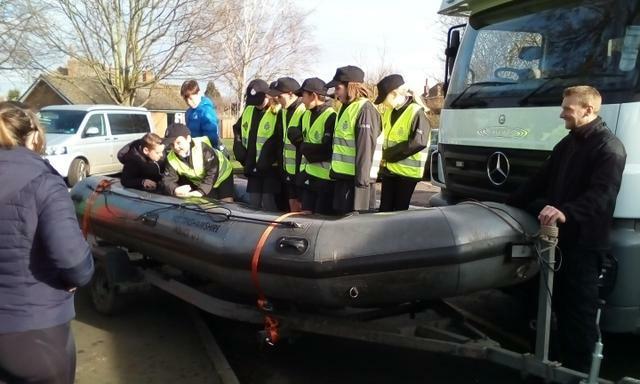 They sat in the driver’s seat of a tram and also had a safety briefing by a representative from Trent Barton Buses too. Finally, they went into the control room and learned how NET keep all the trams running on time. 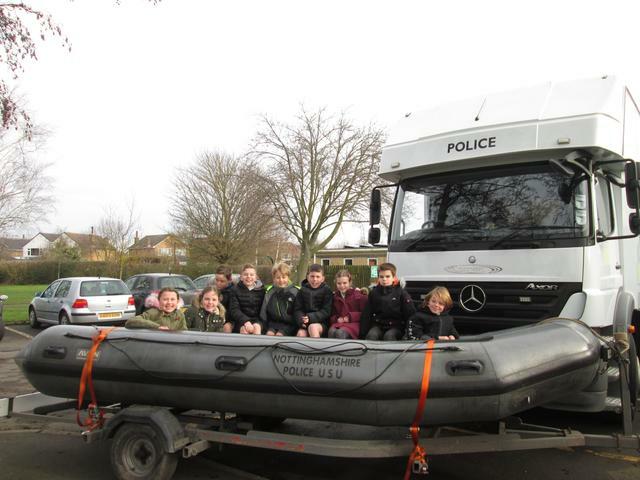 On Tuesday, the Mini-Police and the rest of Year 5 had a visit from the Underwater and Specialist Search Unit. 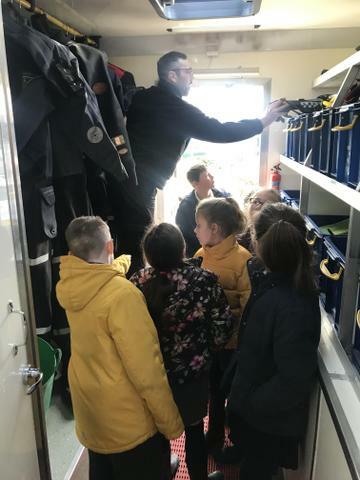 They talked to the children about their role, their experiences and let children explore inside the van and sit in their rescue boat. 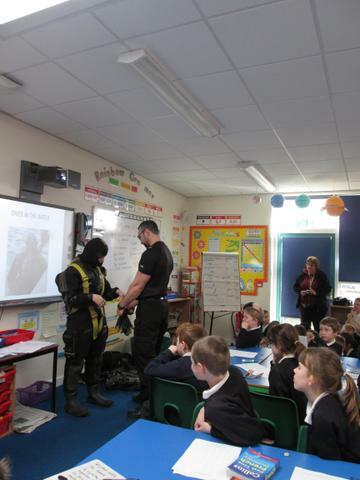 The children particularly enjoyed watching the teachers get dressed up in underwater gear! 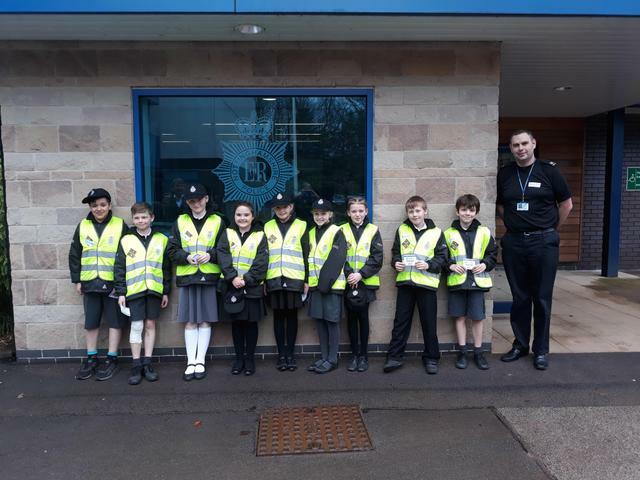 Last Friday, some of our Mini-Police graduates attended an event at Nottinghamshire Police's Headquarters to celebrate the Mini-Police's 1st birthday. 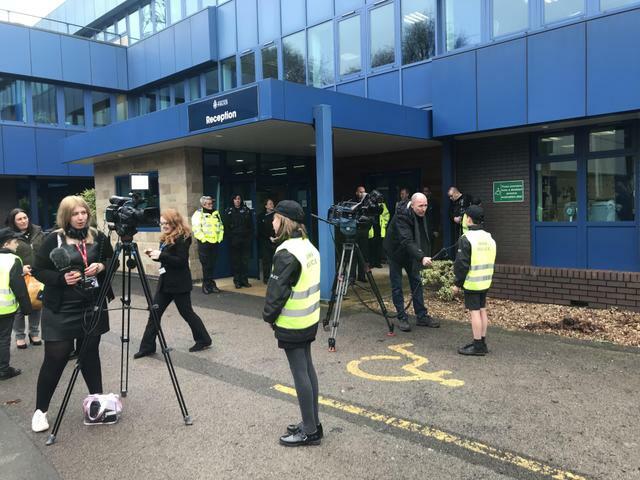 Molly and Tom were interviewed by Notts TV and ITV News! 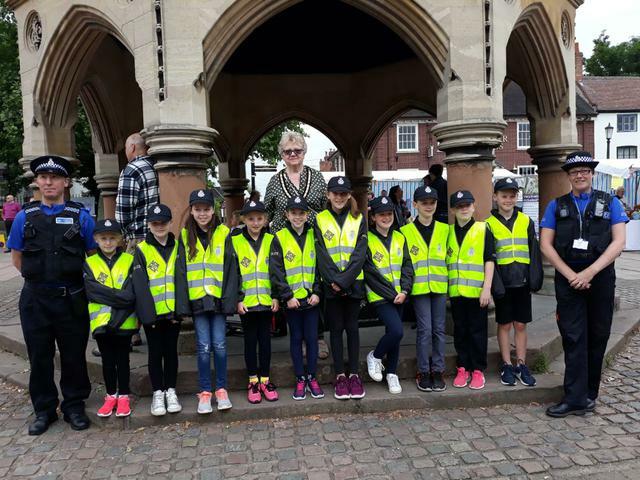 Throughout the last year, the Mini-Police have learned about cyber-bullying and road safety, used speed guns, attended local events such as the Remembrance Parade in Bingham and learned about water safety with the RNLI and plenty more! 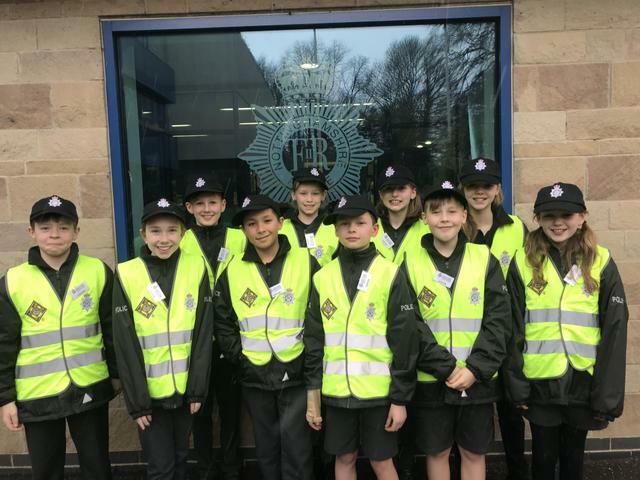 The latest recruits (current Year 5s) have recently completed their applications and will start their exciting venture this term. 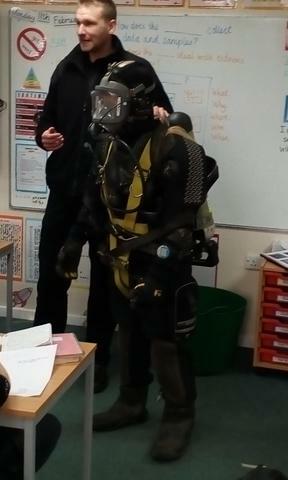 They begin with a visit from the Underwater and Specialist Search Unit next Tuesday in school. 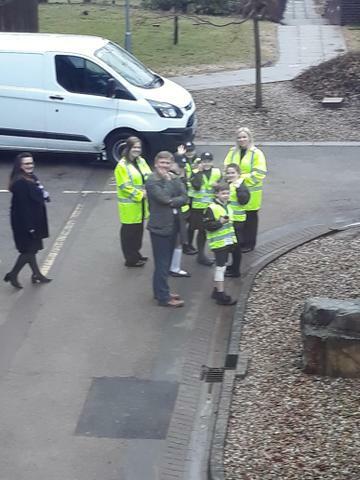 Three of our Year 6 Mini Police, Harry, Molly and Ciara, attended a ceremony with Mr Cunliffe last Friday at the Police Headquarters as part of their Remembrance Day events. They had the opportunity to meet the police dogs as well! 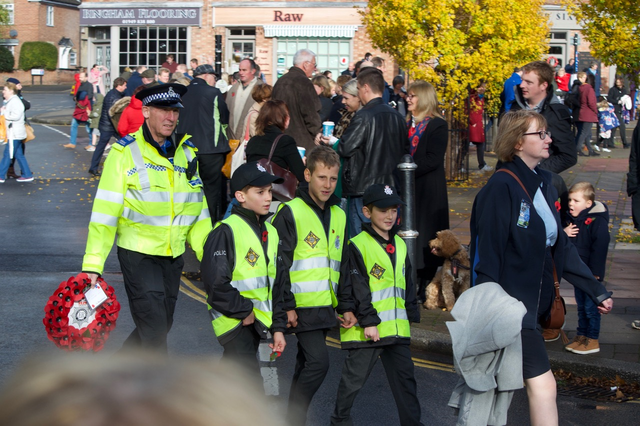 Also, Harry, Lewis and Thomas from Year 6 represented the Mini Police in the Remembrance Parade through Bingham on Sunday. Well done to you all. 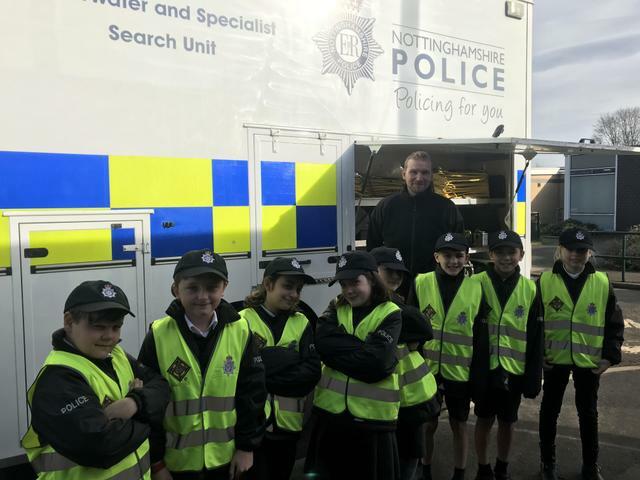 The Mini-Police held a competition for children to create a Cyber Bullying Poster to be used by Nottinghamshire Police in schools. The winning poster is by Megan in 4CF. 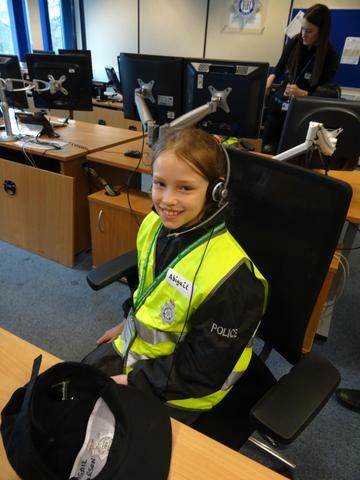 The Nottinghamshire Police will be using this poster in schools across the county and Megan will be presented with a prize in the New Year. 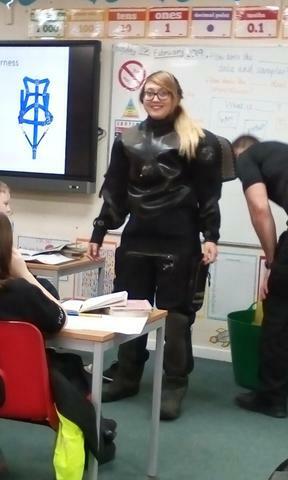 Well done Megan! 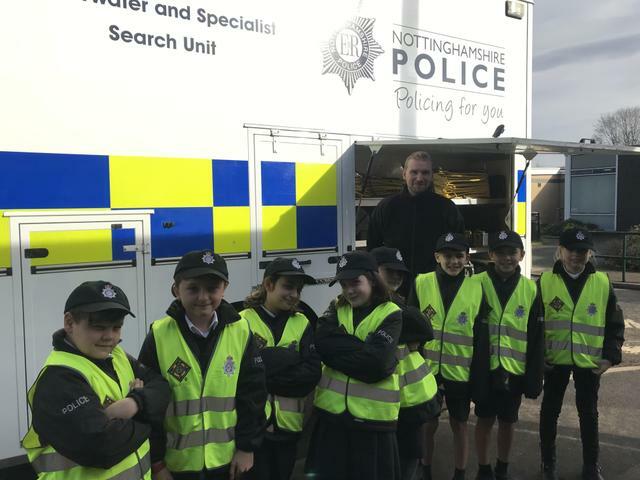 The Autumn Term Mini-police, who are currently in Year 6, have planned an optional homework for children in Years 3-6 about Cyberbullying. 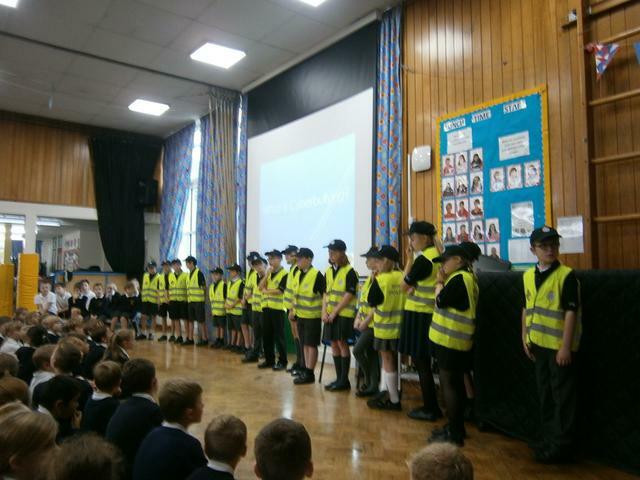 This follows on from their assembly on Wednesday where they talked about Cyberbullying and the impact that it can have. 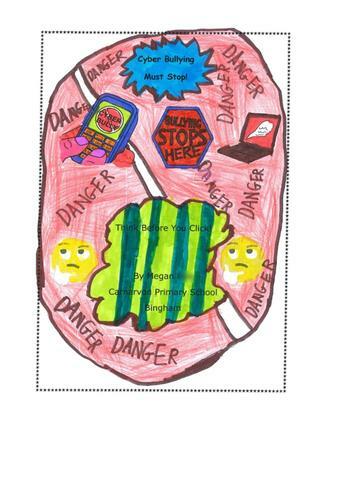 The homework is to design a poster to prevent Cyberbullying. The design can be in either felt tip or crayon (something that can be easily photocopied, so no crafts please). 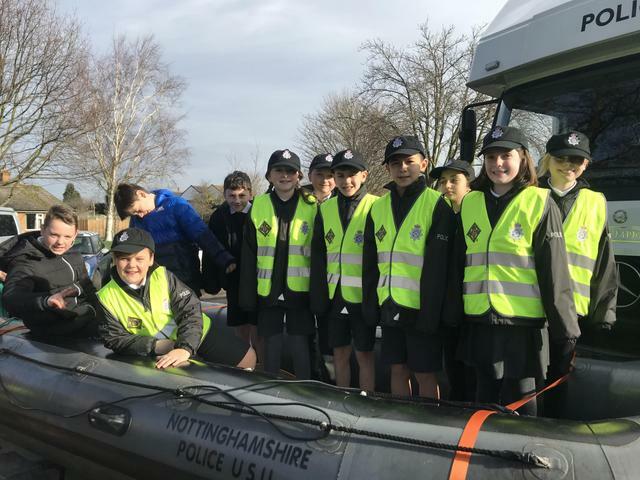 The top three designs will be sent to Nottinghamshire Police, who will be selecting posters to use in Nottinghamshire schools. Deadline for entries will be Friday 26th October. Please hand your entry into the office and make sure your name and class are on the back. 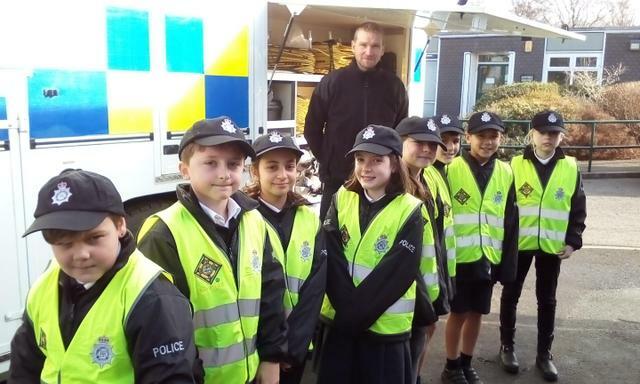 10 of our Mini-Police members helped out during Bingham Town Fair last Saturday. They assisted the police during the event and enjoyed walking around talking to the community. Pictured below are the police officers with the children and the Mayor of Bingham. 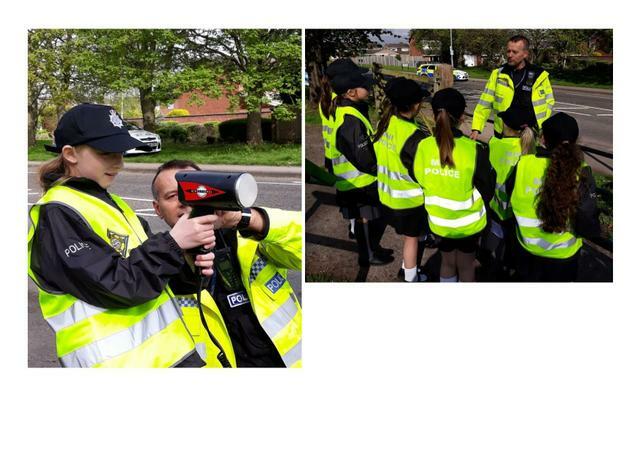 Some of our Mini Police went out into Bingham last week to try their hand at using a speed camera gun to monitor the speed of passing cars. 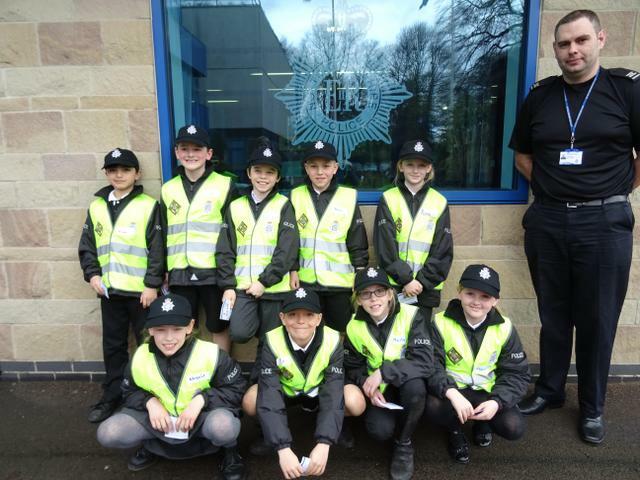 The Mini Police in Year 5 have visited the Police Headquarters at Sherwood Lodge this week. 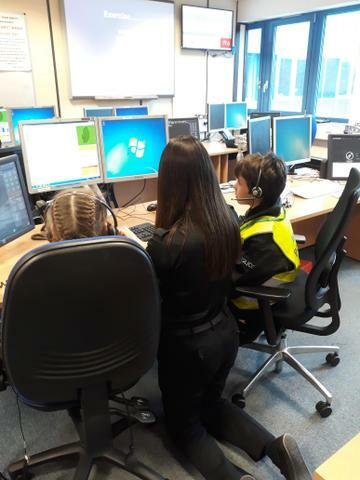 They had a look around the Control Room where the calls are taken and had the opportunity to use the headphones to log a call and give out instructions to each other as the police would do. Take at look at the pictures below, to see what they got up to. 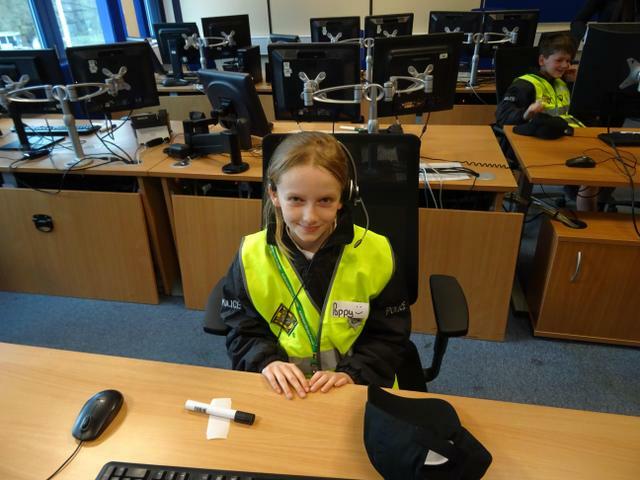 Niamh and Dan from Year 5 visited the control room at Nottinghamshire Police Headquarters as part of the mini-police scheme. 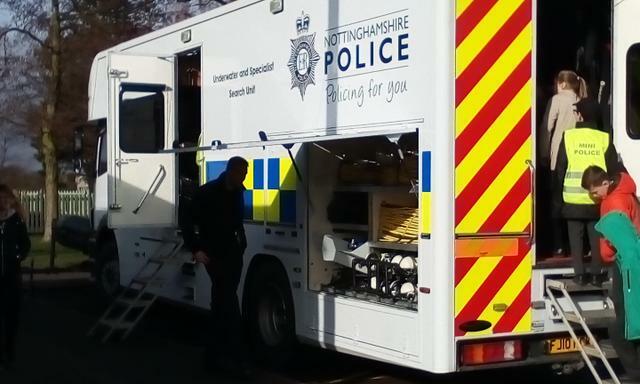 Here is a picture of them inside a police van. 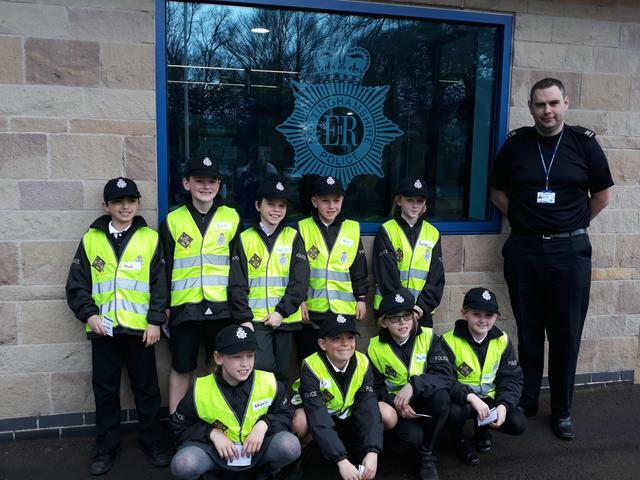 The first group of Mini Police from Year 5 attended the Mini Police Launch yesterday at Southwark Primary School in Basford. 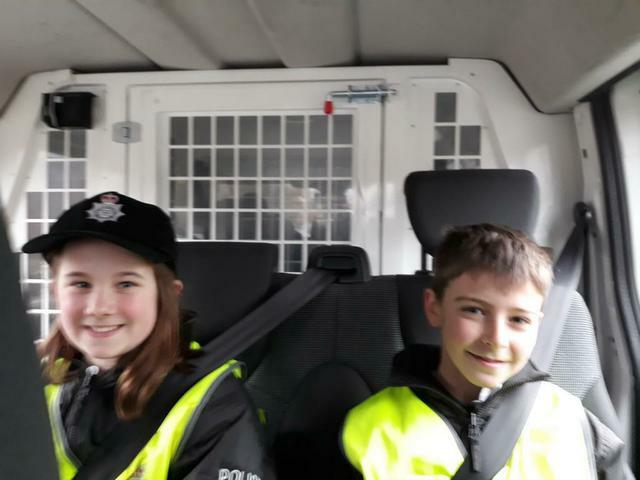 The children looked at their fingerprints, learned about what the police dogs do, sat on a police motorbike and sat in a police car! 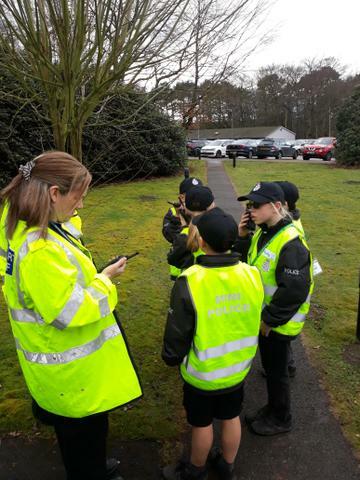 They also used the walkie-talkies to try and find where the 'robbers' were hidden. 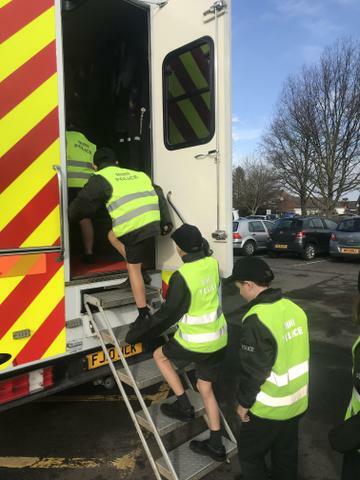 The children will be taking part in a variety of events throughout the year, both in and out of school and we will keep you updated on this in the future.